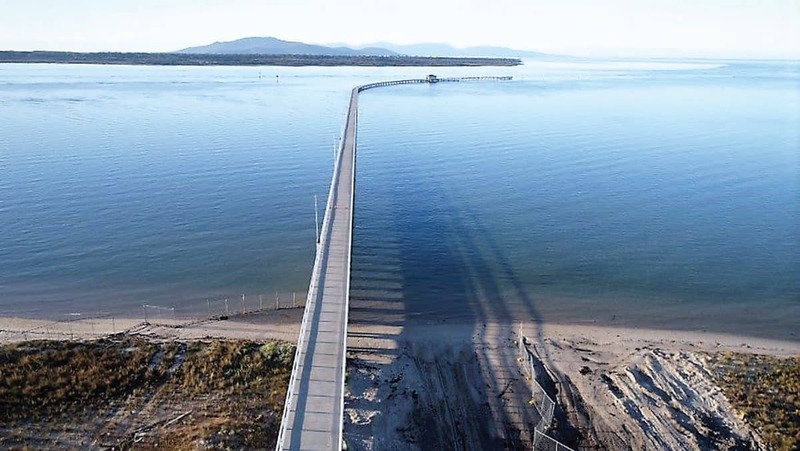 ALTHOUGH the rehabilitation of the Port Welshpool Long Jetty is still ongoing, the Project Control Group has confirmed the facility will be open from COB Friday, December 21. The unofficial opening will ensure the jetty can be enjoyed by the public over the summer period. Additional work is still required before the official opening in March/April 2019. It is anticipated that these works will be carried out while the jetty is open, but certain areas may need to be restricted to the public to ensure safety. South Gippsland Shire Mayor, Cr Don Hill is excited about the jetty opening. ‘“The community has been awaiting this project for many, many years and it was starting to look like it might never happen as the previous long jetty slowly disintegrated into the sea. “Thankfully the State and Federal governments agreed to fund the project in conjunction with South Gippsland Shire Council and work was begun bringing us to this point in time where the project is nearly complete. It is exciting that the community will be able to make use of the new jetty ahead of its official opening next year so from COB on Friday 21 you are welcome to access and enjoy this wonderful new facility”, said the Mayor. $10,858,100 has been committed to the Long Jetty project with $1M provided from South Gippsland Shire Council, $5M from the State Government and $4.8M from the Australian Government. The jetty will help to attract new visitors, and particularly fishing enthusiasts, to Corner Inlet and South Gippsland. Conveniently located close to the Great Southern Rail Trail, the newly refurbished asset is a must do this summer. Council would like to thank Gippsland Ports and the contractor who have been working hard to ensure the facility is available for everyone to enjoy over the summer season. Works to complete the finishing touches will resume in January.